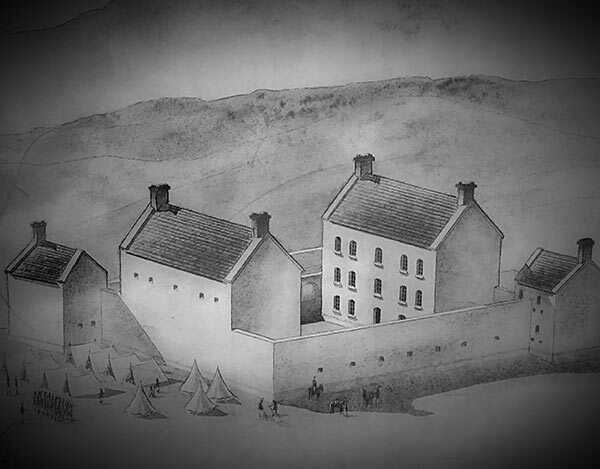 The Garrison Of Inversnaid was built in 1718 following the Jacobite uprising of 1715. The Duke of Montrose employed Rob Roy MacGregor as his chief cattle procurer and herder. Rob Roy borrowed a sum of money from creditors and was unable to pay it back right away so they placed an ad in the Edinburg gazette thus declaring him an outlaw. As the employer of Rob Roy the Duke needed to be seen to be disciplining his rogue employee and so he wrote to the King of England and requested a Garrison be built in the centre of Clan Gregor land, which of course is right here. The Duke and Rob Roy feuded for many years. The Duke had the Garrisons soldiers burn down Rob Roys house at Coriarklet , and so, Rob Roy abducted the Dukes Factor and held him hostage on factor Island just opposite the Pier Cafe on Loch Katrine. Whilst holding the factor hostage Rob Roy went around collecting the land tenants money and signing in the Dukes name. The Garrison remained a garrison barracks for 80 or so years and then was owned by 2 ladies who used it as a kind of 'Inn'. After this it was owned by the Buchan family who extended the original Garrison walls and made it into a sheep farm up until around 1980. The Garrison was then sold along with the Inversnaid Hotel in 2002 to Mike Wells who along with his son Neil, own the Lochs and Glens holiday company. We (Paul and Kelly Bray) then bought the farm in a dilapidated state in 2014. Since then we have replaced fencing and reinstated the farm to a small holding, renovated the property and created the bed and breakfast business.